As I wave goodbye to summer with my (slightly) tan hand, I pause briefly for a moment of reflection. This summer was filled with food and laughs, but I’m so beyond ready for Fall. And no, it has nothing to do with PSL’s and boots. I’m not THAT basic. It’s because I haven’t stopped sweating since June. It’s gross and I’m over it. That said I’m sure I’ll be bitching about the cold in no time. If I’m not homeostatic all the time, I’ll be complaining. What I’m trying to say is, I’m really pleasant to be around. Weather irritability aside, the one thing I can always count on is Football. And most importantly, FOOTBALL FOOD. I cook a lot of it which is probably the only reason I still have friends. WINGS. CHILI. GUAC. NACHOS. PIGS IN BLANKETS. These are a few of my favorite things. And I’d like to share my recipe for buffalo wings. I didn’t intend for that to rhyme but I’m glad it did. This is the first time I’ve ever released this recipe, and I’m telling you, you will thank me later. Everyone is obsessed with these wings, and it’s not that hard to see why, if you know anything about cooking. Even if you don’t, it’s still easy to see why. I think. I use the “boil & broil” method. I know you’re probably shocked that I don’t deep fry them, but I’m telling you, this is the way to do it. It just infuses the wings with flavor from the inside out. You CAN fry them after boiling if you want though. Trust me, I’m not stopping you. Fill a large pot halfway with tepid water. Add the spices. Add the chicken wings to the water mixture and bring to a boil. When they reach the boiling point, the chicken wings should float to the top and look puffy. Let them boil like that for an additional 10-15 mins. Line a baking sheet with tin foil and spray with cooking spray. Add wings to sheet pan. Broil for 10 mins or so per side, flipping occasionally in between to desired crispness. I like mine crispy. While the wings are broiling, make the buffalo wing sauce. This is fairly simple. Add butter to a small saucepan. Add the Frank’s red hot. Stir until butter is melted. Done. If you like your wings spicier, add more Frank’s. 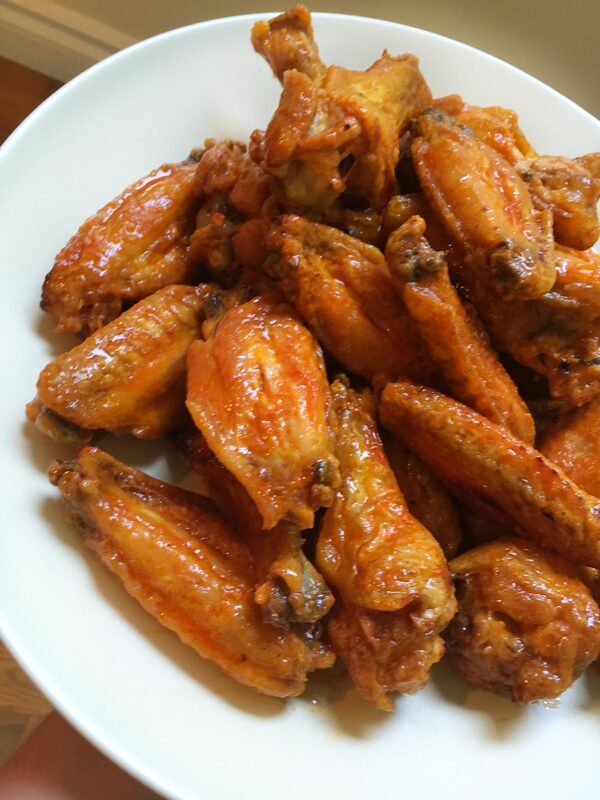 When the wings are crisped and browned (and they will shrink a bit, which is what you want), put them in a large bowl and toss with the buffalo sauce. Serve with blue cheese dressing or Ranch if you’re one of those. I just made this recipe, and I’ve never made wings before! 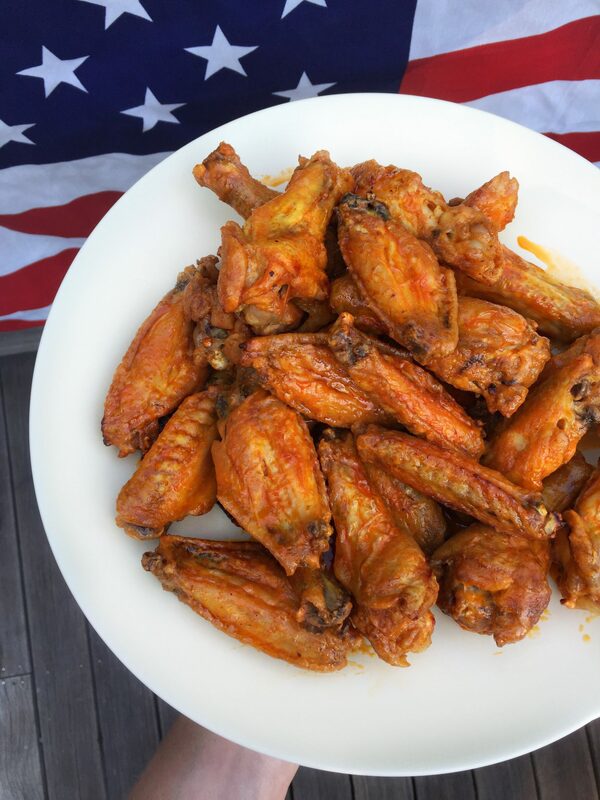 They were outrageously delicious…I couldn’t get over how crispy and flavorful they were….excellent addition to football Sunday recipes. I may never order wings again after making these! Thank you for sharing the “yum”! Hi Sue! Love love to hear that! I was always intimidated by wings too but after this, I feel like a pro 🙂 happy Sunday! Looks so good. I’m gonna do this! Thank you!